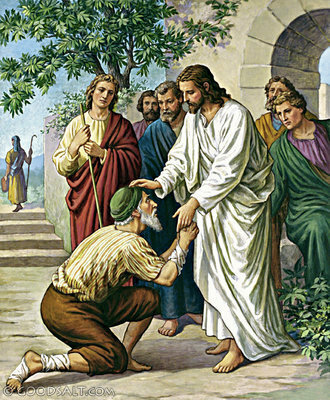 “When Jesus and his disciples arrived at Bethsaida, people brought to him a blind man and begged Jesus to touch him. Then he sent him home and said, “Do not even go into the village.” -Mark 8:22-26. Saint Conrad was living peacefully as a nobleman of Piacenza. He had married when quite young and led a virtuous and God-fearing life. One day, when engaged in his usual pastime of hunting, he ordered his attendants to set fire to some brushwood where game had taken refuge. The prevailing wind caused the flames to spread rapidly, and the surrounding fields and forest were soon in a state of conflagration. A mendicant who happened to be found near the place where the fire had originated was accused of being the author; he was imprisoned, tried and condemned to death. As the poor man was being led to execution, Conrad, stricken with remorse, declared the man innocent and confessed his own guilt openly. In order to repair the damage of which he had been the cause, as he then volunteered to do, he was obliged to sell all his possessions. He repaid his neighbors for all the losses they had suffered, then retired to a distant region where he took the Third Order habit of Saint Francis, while his wife entered the Order of Poor Clares. After visiting the holy places in Rome, he went to Sicily and dwelt for forty years in strict penance, sleeping on the bare ground with a stone for pillow, and with dry bread and raw herbs for food. God rewarded his great virtue by the gift of prophecy and the grace of miracles. He died while praying on his knees in 1351, surrounded by a bright light, in the presence of his confessor, who was unaware for some time of his death because of his position. He is invoked especially for the cure of hernias.